Gas Grills in the $2000 and $4000 (see my list of the Top 10 Gas Grills between $2000 and $4000 for specific recommendations) are generally very good and I bet you would be happy with but that doesn't mean you shouldn't know what you are looking at before you buy or that there isn't going to be some confusion. There are many gas grills and gas grill manufacturers in this price range and they all have a reason for you to buy from them. You are not going find most of these grills are major retailers so you are going to have to look for them at specialty retailers. Look for Barbecues in the phone book. Gas grills in this price range tend to be large and loaded with features. You are also going to find many grills that are either entirely infrared or have infrared extras like sear burners and rear mounted infrared burners. At lower price ranges these infrared burners tend to be fragile and can break easily. In this price range, they don't tend to suffer from this problem. Look for brand names and suppliers that offer support and possibly installation. While the grills I list in my Top 10 Gas Grills between $2000 and $4000 are freestanding grills, most of these come as head only options. These are for custom enclosures or grill islands. If you are going this route it is important to choose the grill you want and not let a contractor or installer force the decision on you. It is the grill you are going to be using, its enclosure is just a decoration. Most of the gas grills in ​this price range are mostly or entirely stainless steel. The same rule of stainless applies here, you want quality stainless that will last and retain its appearance. You can generally tell quality stainless steel by putting a magnet on it. If it sticks to the stainless is not good, if it won't then it is good stainless. While this is a good rule to follow, not all magnetic stainless is worthless. You need to look at the track record of the company who makes a grill before you buy it. When it comes to the extra features like rotisserie kits, sear burners, smoker boxes, side burners, lights, and all the other items these manufacturers load on to these gas grills, pick what you want. Of course, there are fewer and fewer grills without all the extras, but if you look you will be able to find some unique and innovative grills, that are just grills. Expect a lot from these grills as well as from the people who sell them to you. 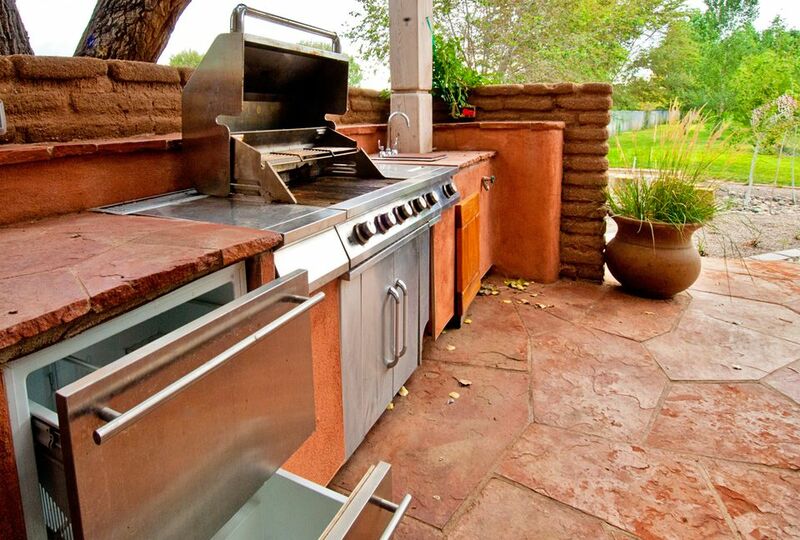 You should easily get 10 years out of one of these gas grills and have minimal service needs. These grills will perform and will give you excellent cooking abilities. The versatility these grills offer will let you cook almost anything you want and you should take advantage of it. These grills should deliver a lot and you should expect it. All gas grills need to be maintained and cleaned and just because you spent a lot of money on one of these grills doesn't mean you can skip these basics. Your best bet to care for your gas grill is to make sure you read the manual and that you talk with the people who sold it to you. Make sure you pay attention and that you do what they say. Regardless of the installation I always recommend that you have a cover for your grill to protect it from the elements and that you periodically inspect the internal components to make sure they are still in good shape. Grills in this price range have good warranties and though you probably don't think you should need to rely on them be prepared to take full advantage of it if you need to.